Yes, this is as amazing a set-up as it sounds. I love curries and Indian food, and I happen to have landed myself in a guest house where there is another long-term resident here from South Africa from an Indian family - you may remember Ashook of the "Ashook's Chicken Curry" post. He's taken it upon himself to make me a series of authentic curries while I am here at the guest house. I just got the hang of the chicken curry he made a few weeks ago, having made a big pot of it this last weekend, and tonight, he made a simple vegetable curry to share with me. I am coming to a realization that I may have been trying too hard with my attempts at Indian food in the past. Adding spice where not so much was needed for an authentic depth of flavor. While I love the recipes I've tried before, the ones that Ashook is showing me combine very basic flavors and he lets those flavors mingle in the pot for much longer than I am used to, creating a delicious - and refreshingly not overwhelming - end result. This one, for instance, uses only fresh chilis and salt as flavoring for the vegetables, and is (once again) one of the most delicious vegetable curries I've ever had. It is so deceivingly simple, yet so wonderfully tasty. I've been promised a lamb curry next weekend. So, as I learn more from Ashook's School of Curry, I promise to relay it all back to those of you who read this blog and love a good curry as much as I do. Heat the oil in a pot, and when it is very hot, add the onion slices. When they start to become translucent, add the tomato pieces, stirring over medium-high heat. Add the 4 - 6 chilis (sliced open), and simmer with the tomatoes and onions until the tomatoes are soft. Add the peas and stir the mixture well, and then cover and simmer. Add salt to taste and let the curry simmer for about 45 minutes to 1 hour until the sauce is very thick, and then serve with a cilantro garnish over rice. Oh, I have missed baking dearly this last month I've been away. I decided to treat myself today and buy ingredients for just a simple recipe, so when I caught a ride in to work this morning, I took a little detour to the Superspar grocery store - the slightly nicer store in Mbabane. And the one that has at least a few gluten-free flour mixes. I had already bought a self-raising flour mix that I was waiting to use, and so I went down the baking aisle and grabbed a bag of coconut, a cheap bottle of vanilla flavoring, and after a careful search that yielded no discoveries of chocolate chips, headed over to the candy section to pick out a dark chocolate bar that I could chop up and use for these bars. These fabulous goodies were inspired by the cookie bars on the Gluten-Free Goddess' website. Karina, who blogs her wonderfully creative and always delicious adventures in the kitchen, came up with this very simple recipe for some knockout cookie bars using coconut, and I basically used the same recipe with a few substitutes for ingredients I could find here in Swaziland. Her recipe calls for chocolate chips; I used a whole chocolate bar. Hers calls for Spectrum shortening; I have roughly zero chance of finding that here and so substituted a baking margarine I found here. I didn't have finely granulated brown sugar, so I used raw. I love vanilla and added a little more than what was originally called for. And instead of Pamela's, I used the only flour mix I have available to me: Orgran Self-Raising Flour mix, free of all allergens. If I could have found any, I would have added some crushed pecans into the batter as well, but alas, only macadamia and cashew nuts showed themselves in the Superspar. As I marched into the kitchen with an armful of baking ingredients, Celiwe looked over at me and exclaimed, "Siphiwe is baking a cake!" with a big smile (Siphiwe is my Swazi name), and she and the other staff watched me with some interest as I started putting the ingredients together, stirring and measuring out the flour and brown sugar. Celiwe stepped in and started stirring the dough for me as I spooned in the flour bit by bit, and when she finished stirring it all in, she took a little taste and said, "Oh! That is nice. That is going to be a good cake, sisi (sister)." And she was right - they were some pretty awesome (and yes, very cake-like) cookie bars. All of the staff tried a piece and they agreed that it was "very nice," one of them even exclaiming, "Oh! If I could have this for Christmas, I would just be happy." So, consider these a treat worthy of any occasion; they're extremely easy to put together, ingredient-light, and everyone will love them. Preheat the oven to 350 F or 180 C. Allow the margarine to come to room temperature and beat, adding the brown sugar in to mix well. Add the eggs and vanilla and mix. Add the flour bit by bit, stirring carefully to mix it all in. Then add the coconut and add 3/4 of the chocolate and 3/4 of the pecans and stir to mix. The dough will be pretty thick at this point. Grease a 9 x 13 pan and press the dough into it, and then sprinkle the rest of the chocolate and pecans on top and press into the dough. Bake for about 20 -25 minutes, being careful not to overbake so it doesn't get too dry. I'd err on the side of removing from the oven after 20 minutes rather than waiting too long. Allow to cool and then either top with a dark chocolate ganache drizzle, or serve by itself - with hot tea or coffee is preferred! I realized that I didn't post a link to this article on my blog when it came out - how silly of me! This is an article from the St. Louis Beacon, a non-profit, entirely online newspaper that is connected with the local PBS station and NPR station. http://www.stlbeacon.org/health/living_with_celiac_disease Not only did they interview me for it, they also included one of the recipes from my blog! I hope you enjoy reading. Thanks to the lovely people at the St. Louis Beacon for the wonderful article! I walked into the kitchen at the guest house tonight at about 8:30 to a flurry of activity, rather unusual for this hour of night when there are only three guests staying here tonight, only one of whom actually ate dinner at the guest house. As I watched, Antonio scooped up huge spoonfuls of something dark purple and ladled them into the large jars that Jose was holding up. Jose then carefully screwed on the lid, dipped the jar in a big pot of hot water to clean it off, wiped it dry, and then placed it upside down on the counter. At first I couldn't see what they were making and mistook it for jam, and my heart swelled for a moment until I realized that it was actually a giant vat of beet chutney. Still, though, I ran to get a pen and paper and copied down the recipe. I have grown rather fond of beets here. A traditional Swazi meal consists of rice or corn porridge (which has the consistency of stiff mashed potatoes), some sort of boiled chicken or beef stew with onions and carrots, potato salad, a squash of some kind, and a serving of beet chutney, which adds a nice sweetness to the ensemble. I didn't realize that I liked beets until I got here. Not that I disliked them, but I guess I've never been presented with so many opportunities to eat them until now. So here is the recipe that Antonio and Jose were using for their chutney, just in case anyone reading this is a fan of beets and would like to tap into the Swazi inside of them. Place the grated beetroot and onions into a large pot and bring to a boil. Add the brown sugar and vinegar and bring to a boil again. Add the curry powder, salt, and cornstarch and stir well, allowing it to thicken. Spoon into prepared jars and seal. The last week I was living in my apartment in St. Louis with my lovely roommates, we decided to make a big pot of one of our favorite easy dinners to use up some of the food I had left: taco soup. Kyle got this recipe from his mother, Diana, and we've made it many times since then because it is so easy to put together, and so delicious. I altered a few things - I added twice the taco seasoning originally called for because I omitted the dry ranch mix - but it turned out wonderfully. It will be ready in as little as 15 minutes, or you can let it simmer and bubble for longer than that to achieve an even richer flavor. It's super easy to make, and it is ready so quickly that this would be perfect for a night when you don't have much time to throw dinner together but still want something filling and satisfying. Serve topped with anything you'd put on a taco that you can tolerate: tomatoes, onions, sour cream, cheese, guacamole, etc. And we top ours off with Fresh Gourmet brand tortilla strips - the fiesta flavor is our favorite, but all of them are good, and most are gluten-free. If you don't have those, any corn chips will work! Brown the meat in a large pot. When it has been cooked, drain the fat and return the meat to the pot. Add the packets of Old El Paso seasoning and stir to mix, and then add the rest of the ingredients listed. Stir well and bring to a boil, then reduce heat and simmer for at least 15 minutes to allow the flavors to mix, but longer if you'd like a little more depth of flavor to develop. Serve topped with any ingredients you would normally use on a taco: chopped tomatoes, chopped onions, guacamole, Tofutti sour cream, cheese (if you can have it), and corn tortilla strips (Fresh Gourmet Fiesta brand is my personal favorite to have with this soup). Avocados. They are everywhere in Swaziland. People eat them with everything. I came into the kitchen at work last week to find several of my colleagues sitting there eating salted mashed avocados out of bowls. Another time, I walked into a room and found one of them using her fingers to hook pieces of the soft flesh and place them directly into her mouth. They eat avocados as an accompaniment to corn porridge. They slather it between thick slices of bread and have avocado sandwiches - with nothing but the avocado and bread - as snacks. Almost without fail, when I open the communal refrigerator at work, there is half of an avocado sitting there, waiting for its time to be devoured. They grow everywhere, and whenever you visit someone's house, chances are they'll offer you an avocado for the road. Which is how I ended up with two giant ones after visiting the homestead of my adopted Swazi mother, Ncamsile. I came home and later that weekend, made a very simple lunch using one of Swaziland's favorite ingredients: an open-faced avocado chicken sandwich. It's so simple; if you have a toaster available to you, toast your favorite gluten-free bread, then spread the creamy avocado on each slice, add salt and pepper to your own taste, and then top with your favorite lunch meat. It's simple and quite delicious. Add a big slice of tomato if you want, or a few slices of red onions. Or just do it the Swazi way, omit all the frills, and stick to the basics - just the avocado and, if necessary, the bread. I came to Swaziland fully expecting to have to abstain from any gluten-free treats while I am here; I was expecting to eat a lot of corn porridge and stew, but not bread. Definitely not bread. So when I was in the local grocery store last week and went down the baking aisle, I was shocked to discover a variety of gluten-free flour mixes available from a company called Orgran, based in Australia. Gluten-free whole grain bread, gluten-free self-raising flour, gluten-free lemon poppyseed muffin mix, gluten-free cake mixes....I truly couldn't believe my eyes. And they weren't just gluten-free; they were completely allergen-free. I indulged and bought myself the gluten-free whole grain bread mix, and this week, I tried it out. Although it is not the most flavorful bread I've tried, I also didn't try to experiment with this batch. I followed the directions on the box exactly, taking their suggestion of adding eggs but just using water and oil instead of trying out a batch with soy milk. I'm sure this would also be great with some herbs mixed in, or with caraway seeds. If you used a flat pan, you could add onion powder, basil, oregano, and parsley and make a nice foccacia bread. I kept it simple, and while it wasn't the best loaf of gluten-free bread I've tried, it was great compared to the complete lack of bread I have access to here otherwise. So if anyone reading this is abroad, look for Orgran - it says on the box that they distribute internationally, and if I can find their products in Swaziland, I feel like everyone has a pretty good chance of finding them, no matter how far-flung your current location is. Ok, I know it might sound like kind of weird combination, but this was actually extremely delicious. The squash made this dish wonderfully creamy, and the beef added a nice contrast to the sweetness of the pumpkin and butternut. I would have used ground turkey in this if it had been available, but all I could find in the supermarket here in Swaziland was ground beef, so just use whatever you like the best. What I'm discovering here is that pumpkin is used often for savory dishes, more so than in America (where we like to bake with it but rarely see it in a stew, for instance). I love pumpkin and other types of squash, so I am enjoying that they are part of the mainstream cuisine here. I threw this mixed rice together because I happened have these ingredients on hand when I went into the kitchen last week to cook for myself, and it's a recipe I will definitely make again. If you're vegetarian, this would be delicious without the meat as well. The rosemary, thyme, and sage in the recipe complement the squash beautifully, and the recipe makes enough for two people easily, with some left over. I didn't want to stop eating this, and even the kitchen staff at the guest house gave me two thumbs up when they tried it and said unanimously, "Kumnandzi!" (which means "delicious" in siSwati). Cook the rice as directed. Cover and set aside when done. Heat the oil in a pan and add the onion. Cook for 3 - 5 minutes until the onion is soft, then add the pumpkin, butternut squash, carrots, and spices and stir well. Cook covered over medium heat for at least 5 minutes, stirring occasionally. Add the ground beef and continue to cook over medium-high heat, stirring often. Continue to cook until the ground meat is completely done, for at least 10 - 15 minutes. The mixture will become slightly creamy as the squash gets closer to being done. When the meat is done, test the squash to see if it is soft. If it needs more cooking time, reduce heat, add a little water, and continue to cook for another 10 - 15 minutes until the squash is very tender. When it is ready, add the soy milk for a more creamy texture, starting with 1/4 cup and adding more if necessary, and adjust seasoning as desired. When you are satisfied with the taste of the squash and beef mixture, add the cooked rice and stir well. Serve immediately. There is a man named Ashook staying at the same guest house I am in Mbabane, Swaziland, who is from South Africa and is of Indian descent. Last week, I was getting out the ingredients to throw together a very simple chicken curry using some store-bought curry paste, and he came into the kitchen and said, "Ach, I'm going to make you some REAL chicken curry." I grabbed a piece of paper, a pen, and my camera and stepped aside to let the man work. We stood in the kitchen, chatting with the other staff here as the curry simmered and bubbled on the stove, sending up delicious aromas of spice into our conversation. Every so often, Ashook would go to the stove, lift the lid gingerly, peek in, and then cover the pot again before rejoining us. Finally, after about an hour and a half of delicately testing the sauce and potatoes, he announced that it was done. He pulled me over to the stove and said, "See how the oil has risen to the top? That means that the curry is ready." He also told me that it is important to let the potatoes sit in the pot without stirring them or they will fall apart before the curry is ready. I spooned some curry into a bowl with the fluffy Jasmine rice I had made (although basmati is the best, in my opinion) and took a bite. And it was heavenly. There is nothing like a good curry, and this one was fantastic. This is very simple to throw together, really - much less complicated than other curries I've made, and it is good. I mean, really good. So, from Swaziland to you, here is the recipe for Ashook's authentic South African-Indian chicken curry. Heat the vegetable oil in a pot and add the onion slices. When the onions are soft, add the chicken, stir, and let cook. Add the turmeric, chili powder, masala powder, and coriander leaves to the chicken and onions and stir to mix. In the meantime, mash 5 - 7 garlic cloves and 1 tbsp. crushed ginger in a small bowl or a mortar and pestle until they have become a paste, and then add 1 /2 cup water to the mixture. Add the garlic-ginger mixture to the pot, and then add another 1/2 cup of water and stir. Let the mixture come to a boil and add the chopped tomato and simmer for 10 - 15 minutes. Add water as needed if the mixture starts getting too thick. When the tomatoes have softened, add the potatoes, chopped into quarters, along with another 1/2 - 1 cup of water. Stir just enough to mix the water in, and then let the curry simmer over medium heat without stirring so the potatoes won't fall apart. The curry is done when the potatoes are soft and the oil has risen to the top; it should simmer for about 45 minutes to 1 hour. Add salt to taste, 1 tsp or more. Serve with rice or naan. Below: The potatoes being added to the curry as it simmers. My sister and cousins and I have a favorite Thai restaurant in St. Louis that we frequent as often as we can afford it, and probably sometimes when we can't, but our love of Thai curry usually trumps an empty wallet. We each have our usual; my cousins like Masman, my sister prefers yellow curry, and I love the panaang. Of course, for the times when I truly can't afford restaurant Thai food, I have my stock of panaang curry paste at home; a small container that costs $1.79 at an international grocery will literally last you until you can't remember when you bought it. When I made this dish, I was getting ready to move out of my apartment, and I was trying to use all of the food I had in the house already without buying new ingredients, so I grabbed the half empty package of thin rice noodles, some frozen broccoli, half of a red bell pepper, and the fried tofu I'd bought the week before and got to work. Note that this recipe is completely adaptable to whatever type of curry paste you like the best, and with whatever vegetables or meat that you want to add. You could buy extra firm tofu, press it, and bake it instead of using fried tofu as well. What I ended up with was a very delicious and panaang-y noodle bowl that was fast and filling. Cook noodles as directed on package by placing them in boiling water for 2 - 3 minutes. Strain the noodles, then rinse with cold water and leave them in cold water in the pot so they won't stick. Place the fried tofu on a lined cookie sheet in the oven at about 400 F and bake until the tofu is puffed up and crispy. Remove from oven and set aside. In a small pot, heat the curry paste for about 30 seconds, and then add the small can of coconut milk and soy milk or creamer. Stir to mix well and adjust the taste as desired. Add the Bragg's gluten-free soy sauce to taste. 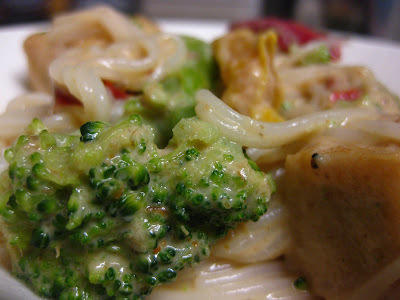 Place the fresh or defrosted broccoli and bell pepper into the sauce and cook over medium heat for about 5 - 10 minutes, until the vegetables are tender. Add more soy milk/creamer if you need more of the curry sauce. Place the desired amount of fried tofu into the pot and stir to mix. 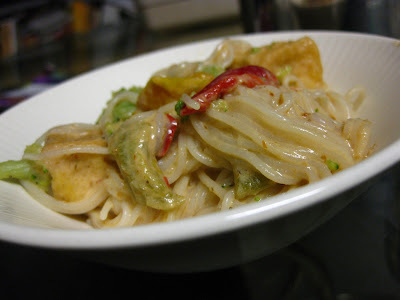 Drain the rice noodles and add them to the sauce, stirring to coat. Be sure to add them in portions so you don't add more than what your sauce will coat. Garnish with another dab of coconut milk if desired and serve. Shabtai Gourment - Gluten-Free and Casein-Free Baked Goods - AMAZING. All recipes, photos, and images copyrighted to Claire Berman © 2008-2012. All rights reserved. Awesome Inc. theme. Powered by Blogger.